Supergirl has become a bit of a drag with this whole humans vs. aliens agenda. But hopefully the death of Mercy and Otis Graves on Supergirl Season 4 Episode 4 is the beginning of the end for the storyline. For how villainous these two supposedly were, their deaths were beyond anti-climatic. One moment they seemed to be the “big bad” that the D.E.O didn’t know how to control, the next thing you know, they’ve ceased to exist. Can’t say I’ll miss them. Their attack at the National City Fair was a feeble attempt at invoking panic onto the humans simply to control the anti-alien narrative. If you have to stage alien attacks on children in order to convince the public that they’re dangerous, chances are they aren’t that much of a threat. Manchester Black was a welcome addition to the series only because he’s delicious to watch. In the comics, Black is a dangerous and manipulative telekinetic, and I don’t doubt that’s where he’s headed now that he lost the love of his life. He may have worked alongside J’onn for a bit to find Fiona but her death devastated him. His goodbye scene with Fiona was deeply heartbreaking and gave him a motive for revenge. Though, technically, if he really wanted to honor her memory, he’d let it go and deliver on his promise of not being angry. But does Black seem like the kind of guy who would let something so personal go? Definitely not. 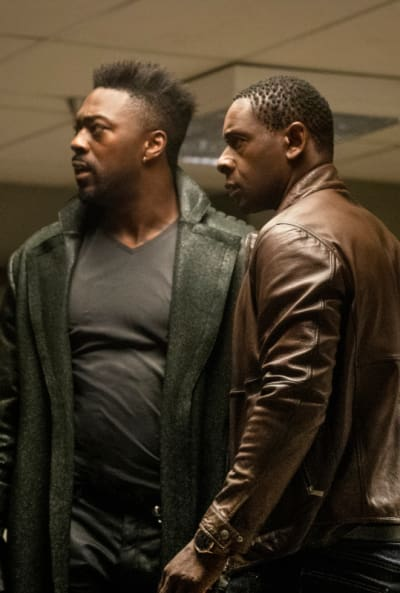 Given that the case of weapons he bought towards the end of the episode, I’d say J’onn should probably cut ties with him before it’s too late. J’onn’s already been tempted to stray from the path of non-violence he promised his father, and Manchester is just fuel to the fire. I can see him becoming a formidable villain for Supergirl considering his dislike for her cousin in the comics. I’m not surprised J’onn feels lost and uncertain when it comes to his contributions to such a personal battle. 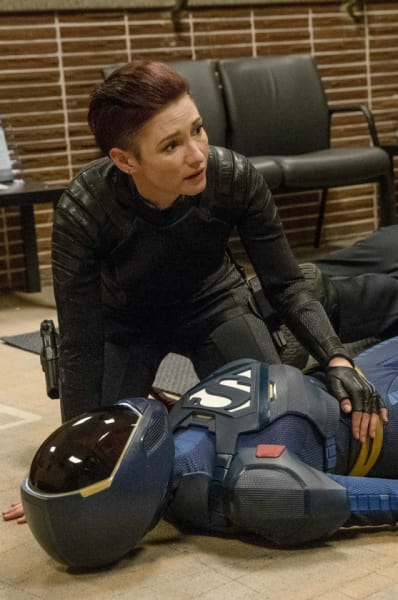 His whole life on Earth has been spent fighting at the D.E.O — how can he in good conscience stand behind when Supergirl is in a life support suit and Alex is struggling to keep things afloat? Speaking of Alex, I don’t recall Hank ever getting reprimanded by the President or anyone in authority in the way that she did. He wasn’t human. He was loose ends. Permalink: He wasn’t human. He was loose ends. There has to be something more to him than meets the eye. I don’t think Alex is doing an incredible job running of things just yet, but she’s getting her bearings and some encouragement from J’onn. He knows better than anyone that being a Director during a time of crisis isn’t easy especially when you’re doubting if you were qualified for the position in the first place. While everyone at the D.E.O congratulated her on a job well done, the president wasn’t nearly as satisfied with her disobeying his orders. He sent Colonel Hayley to “oversee” things until she can get a better handle on them. How does anyone expect her to control Supergirl? How funny was it when they told her to “take it easy” as the mind-controlled aliens attacked a Ferris Wheel filled with children? Was that Supergirl? Or one of the blokes from Daft Punk? Permalink: Was that Supergirl? Or one of the blokes from Daft Punk? While I agree it wasn’t wise of Supergirl to head out to battle before she was ready, how could we expect anything less? This is her thing. She’s a hero, and heroes follow their gut and run into the fire even when they are told not to. I thoroughly enjoyed Lena’s bonding chat with Brainy specifically how she told him to compartmentalize all his human emotions — anger, sadness — into tiny little boxes. I’m going to have to try that tactic. Also, Brainy cries now which makes me so sad. We’ve ruined him. Once Brainy was able to clear his head, he realized that the solution to purifying the air of Kryptonite was right in front of him. Literally, Lena had nanites at her Laboratory that could get the job done. Once the atmosphere was clear, Supergirl was able to return in all her glory and regain strength by stuffing her face with rhubarb pie. But while our girl was getting her dessert on, the “Red Daughter” was getting her training on. 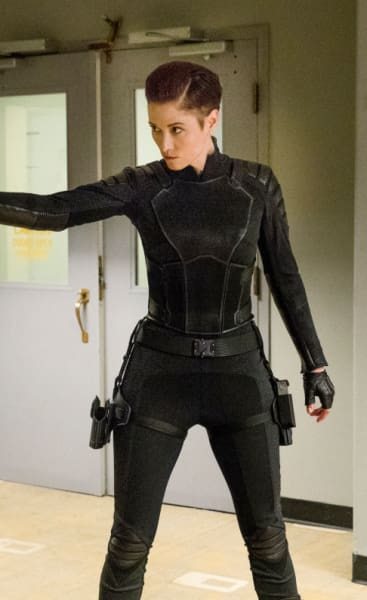 We haven’t seen or heard anything from the Russain version of our heroine since Supergirl Season 4 Episode 1 so my interest is officially piqued. What is she training for? A battle with her doppelganger self? 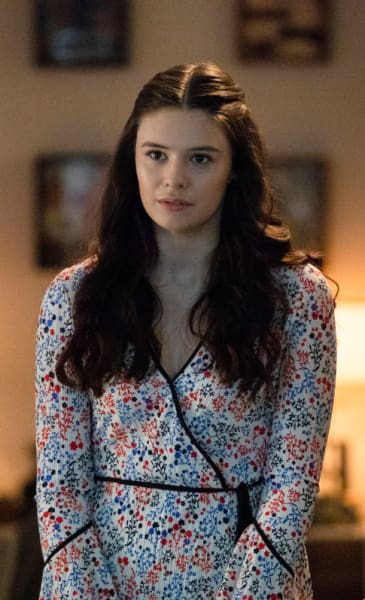 Is she the real villain of Supergirl Season 4? Because that’s something I get behind. James Olsen resurrected his Guardian suit to lend a hand while Supergirl was out of commission. Heroes go out there even when they know something bad is going to happen. That’s what makes them heroes. His struggle with the responsibility makes sense there are two sides to the coin. On one hand, he was told he’d be jailed for putting the mask back on, but on the other hand, he has a duty and heroes always take risks for the greater good. I didn’t really understand why Nia woke up from a nap (go home) and decided it was her place to discourage him from jumping into action. All of her actions with him have been so random. It baffles me that the government doesn’t think it’s a good idea to bring in another hero while Supergirl is sidelined. Why can’t the D.E.O grant him immunity or make him an honorary vigilante or something? If he’s working alongside an organization, how is he any different than Supergirl? His return to the streets went viral, but as we all know, sometimes viral isn’t always a good thing. In this case, he became a figurehead for the anti-alien movement. While James knew he was fighting aliens that were being controlled by the Graves siblings against their will, many people didn’t. I’m not a robot. I’m techno-organic. I have feelings. Permalink: I’m not a robot. I’m techno-organic. I have feelings. Yep, the Agent of Liberty is going to be knocking on his door soon enough. What does he have planned for him? Maybe James should have taken Nia’s advice. Based on the teaser, the parasite is going to make Jensen strong enough to absorb all alien powers. Will Supergirl find a way to take him down? And how does using aliens to do your bidding make the Agent of Liberty any better than the D.E.O? Share your thoughts below and watch Supergirl online to catch up! 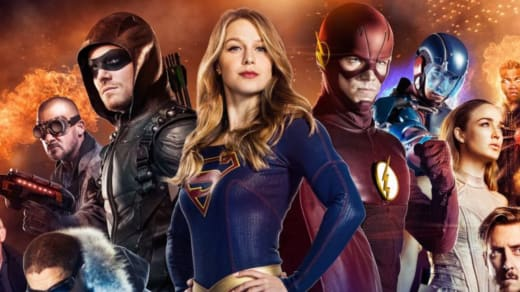 View Slideshow: The CW Cheat Sheet: Which Shows Are in Danger? !